Many classic stories have a component of self-sacrifice for the greater good: Harry Potter, Lord of the Rings, the original Star Wars. Heck, even Frozen has its “Paschal Mystery moment,” when Anna throws herself between her sister and the enemy’s blade. 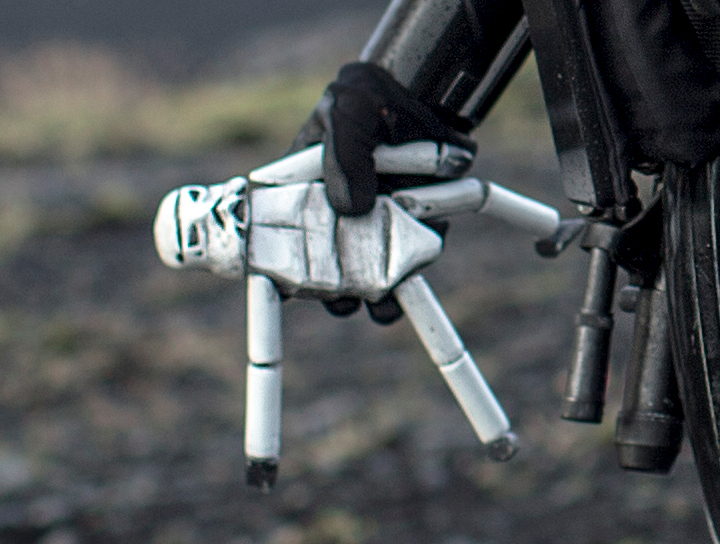 This notion of loving self-sacrifice that brings profound, new hope – which Christians call the Paschal Mystery – gets far more than a moment in Rogue One; its treatment is thorough-going, multi-faceted and reconsidered for modern audiences. The film’s ensemble cast shows there is more than one path toward a life of relinquishment, lived in deference to the greater good. Each member of the Rogue band is a pilgrim of sorts, on a distinctive path toward the same end, providing his or her own particular insight into what living the Paschal Mystery requires. For Chirrut, Cassian and Jyn, those insights can be summed up in the Christian virtues of faith, hope and love. “May the Force of Others be with you!” shouts Chirrut Îmwe, a blind Temple guardian, in the streets of NiJedha. Star Wars uber-nerds did little happy dances in their seats when they heard the Force referred to here by its original full name, found in Lucas’ penultimate drafts of the original movie. Chirrut’s faith in the Force of Others – in the collective power of all living things, knitted together by the vast web of our shared being – draws us in, just as it draws Jyn. Can there be a Force of Others? Are we really bound together, surrounded and penetrated by the energy of all the living? Chirrut answers these questions with a miraculous display of “sight,” mauling half a dozen Stormtroopers with only a staff and his faith that “all is as the Force wills it.” More than mere display, it is a sacrifice on Jyn and Cassian’s behalf he needn’t have made. It leaves an impression; blind faith is not foolish or helpless. Later, Chirrut’s faith in the Force of Others is distinguished sharply from Cassian’s willingness to follow orders he knows to be wrong on Eadu. Chirrut rejects Cassian’s path, instead choosing to follow Jyn, whose “path is clear.” Pretty observant for a blind guy. And while Cassian, in his desperation, had planned to take out one Imperial (Jyn’s father), Chirrut, in faith, uses the Force to shoot down a TIE fighter, nearly taking out the entire Imperial operation on Eadu. 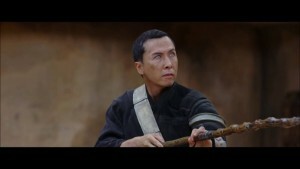 In the end, Chirrut’s radical faith, represented in his mantra “I am one with the Force and the Force is with me,” allows him to perform the miraculous act that makes the mission a success, even if he doesn’t survive it. He walks unscathed through a shower of blasterfire toward his goal, chanting his mantra. The faith of Chirrut is no bigger than a mustard seed next to the power of the vast Galactic Empire, but it is enough to move mountains, or in this case, the all-important Master Switch. He dies victorious, passing the mantra to the more skeptical Baze Malbus, who carries it forward toward his own heroic end. 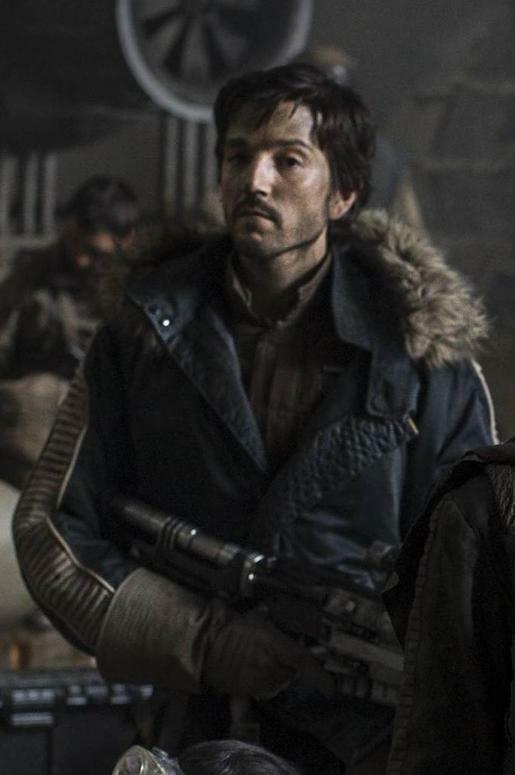 In Cassian Andor, Star Wars fans are presented with an uncomfortable moral conundrum. Aren’t the Rebels supposed to be the good guys? Yet here is one who kills his panicking informant at the trading post, presumably to ensure his own escape from Imperial soldiers. When we meet Cassian, he is down a deep hole, both physically and morally, and must climb out as the film progresses. Still, on Jedha, he plants the notion that “rebellions are built on hope” in Jyn’s mind – a notion that will carry the Rogue band to the very end. Cassian is an ambivalent character who has let “the cause” rob him of his humanity and his hope. In the prison cell in Saw Gerrera’s lair, Chirrut Îmwe calls him out, not for his lack of faith, but for becoming a slave to his noble ambitions, creating for himself a prison of inhumanity to carry with him everywhere he goes. The triumph of Cassian’s pragmatism is on display when he responds to Îmwe that he is starting to think he and the Force have “different priorities.” What are the Force’s priorities, but the peaceful union of all living things? So what have Cassian’s priorities become, if they differ? In the face of a peace that seems too far off to hope for, Cassian the cold strategist has won out. We’ve seen this triumph of pragmatism before in Star Wars; Mace Windu compromised his Jedi commitments to due process and the use of violence as a last resort in his attempt to execute Palpatine in Revenge of the Sith – an act which played an essential role in the vilification and destruction of the Jedi Order. Cassian knows rebellions are built on hope, but if hope is the foundation for his own actions, it is a one that has nearly worn away. Ph: Jonathan Olley ©Lucasfilm LFL 2016. The burden of Cassian’s past in the Rebellion had robbed him of hope. But he now realizes he must play the long game, sowing seeds he will not reap. Cassian’s new-found sense of hope will purify his actions, as in the first letter of John (3:3): “Everyone who has this hope based on [God] makes himself pure, as he is pure.” The ancient historian and Christian apologist Tertullian famously said “the blood of the martyrs is the seed of the Church.” But great acts take time, and sacrifice – not of one’s humanity, but sometimes of one’s whole person. 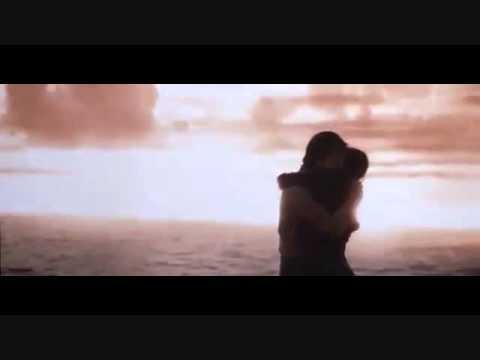 Cassian will make his final sacrifice on a beach lit up by what looks much like the sun rising on a new day of hope for his beloved Rebellion. 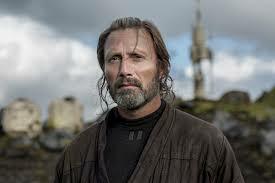 When we talk about Jyn, we must speak also of her parents, Galen and Lyra, because their sacrifices in the beginning of the film provide Jyn formative examples of living the Paschal Mystery. Many Star Wars fans felt rattled by the filmmakers choice not to employ the “opening crawl” in Rogue One. (For laypeople, the “crawl” is the text which rises before the audience as Star Wars films open, supplying the needed context for a story that always begins in media res.) But I say: don’t get stuck in the mold, Star Wars fans. Rogue One does something more powerful in its opening scenes, from a storytelling point of view: it shows instead of tells. It shows both of Jyn’s parents sacrificing themselves in different ways for the protection of their daughter and of the galaxy. This sort of thing would certainly have lost impact, squeezed into a 75-word crawl. Jyn’s parents have prepared meticulously for the day when the Empire will come to take Galen, a brilliant scientist, to complete the design of its superweapon. When the Empire arrives to collect him in the film’s first scenes, Galen makes up lies to feign his cooperation. He plays the long game, though his ultimate plan to subvert the project may, like the Death Star, not yet be fully developed. But Galen seems to know, where there’s life, there’s hope. Despite these gifts of hope and faith from her parents, Jyn is lacking an essential virtue: love. Fifteen years later, she has become a cynical young woman who doesn’t hold political opinions, refusing to see the “big picture” for which her parents sacrificed themselves. She is alone, friendless and deeply skeptical of people and their “causes.” Yet she wears the necklace her mother gave her, and though she “prefers” to think of her father as dead, we get the sense she hopes otherwise. But without love, this hope is difficult to sustain. “We’re not here to make friends,” Cassian says to her, when she feels drawn toward Chirrut’s blind understanding on Jedha. But Jyn is here to make friends, for hers is a journey of love, the kind of love Jesus commanded: the greatest kind, that lays down its life for a friend (John 15:13). This love is at the heart of the Paschal Mystery; Benedict XVI calls it “love in its most radical form.” It is the kind of love her parents, with their own sacrifices, planted in her heart like a seed. The seed begins to grow when Jyn instinctively risks her life to pull a screaming toddler out of a fire fight on Jedha. 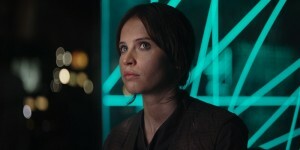 Then, confronted with her father’s holographic message, Jyn breaks down, succumbing to the love she feels for him, and allowing it to fan in her the faith and hope her parents exampled. When her second father, Saw Gerrera, goes down with his ship on Jedha, Jyn knows Saw’s hope-less path is not for her. She must deliver her father’s message – and deliver her father, if she can. Future glory is something the Rogue One band will never know, in this realm. But Star Wars fans know it in the goosebumps of pride we get now, every time we watch the opening scenes of A New Hope or hear the call sign “Rogue” in Empire Strikes Back. Admiral Raddus articulates our hope that indeed, the Force of Others is with them in death, as it was in life. 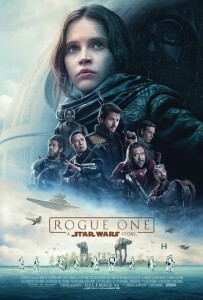 It can be argued that the Rebellion ultimately succeeds because of these scattered individuals who become “[Rogue] One,” just as the Church grew into One Body out of the sacrifice of Christ, its head. Chirrut’s constant faith and Cassian’s renewed hope were essential to the success of their mission, but in Jyn, the Rogue band was led by love, that greatest of virtues, which “bears all things, believes all things, hopes all things, endures all things.” (1 Cor. 13:7) And love never fails. Follow Emily Strand on Facebook and Twitter (@ekcstrand), and please share your own thoughts about Rogue One and the Paschal Mystery in the comments. So, what's this lady in a boat got to do with anything? When was the last time you read a book for fun? For education? For spiritual enlightenment? When was the last time it was all the same book? The problem with implicit assumptions about the world, of course, is that they’re implicit. It takes a lot of self-scrutiny and a willingness to succumb to an outside critique from art and truth to expose them. So what do you do when you’re too busy to read those sorts of books, watch those sorts of films, visit those sorts of galleries? What do you do when you’ve been trained to operate within rigid compartments and methods of scrutiny that ignore the silent power of Story? What do you do when you’re supposed to be the one with all the answers?